Weight, bad. More power, good. That, in a nutshell, is Lotus's latest featherweight flyer. Perfection for an extra $8230. That's the premium to pay for the new 2008 Elise Supercharged — it's worth every penny. Lotus USA arranged a drive of the new car along a route that is dear to my heart. While I lived in Southern California I routinely made the same Sunday morning pilgrimage in whatever sporting motorcycle or car I had available. And it was on this strip of tangled asphalt ribbon that I learned what it really means to go fast. The new Lotus - with its 218 horsepower and torque made low starting at 4000 rpm but peaking with 153 lb.-ft. at 5500 rpm - is likely one of the fastest rides down my beloved road ever. It's faster down the hill than many of the local sport-bike riders who infest the area on weekends, and that is some high praise. The addition of 26 lb. in the form of a Magnusson M45 Roots-type supercharger and miscellaneous bits are all that's needed. The inline-4 engine is the same, but for the extension of a belt to drive the supercharger pulley and the replacement of the intake manifold. The new manifold is integrated into the casting of the supercharger housing, thus making everything compact enough to fit in the engine bay without requiring major retooling. An elegant and appropriate solution, as Lotus is a firm believer in keeping things simple and light. The car weighs in wet at 2006 lb. Why not the 240 bhp of the Exige S240? That model's supercharger is different and the Elise's intake system is lacking an intercooler. 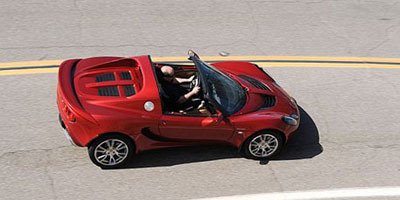 The intercooler of the Exige S240 sits over the engine under the rear hatch window. In an Elise that space does not exist. Everything else on the car is mechanically the same for the SC and normally aspirated car. For 2008 there are some revisions. Only a Touring and Sport package option will be available for the Elise. Of note is that the Sport package no longer comes with Advan A048 tires, but shares the Neova tires of the Touring package, albeit mounted on lighter-forged wheels. Traction control and a limited-slip differential are the only other options, but Lotus recommends the LSD only for the most demanding of tight tracks, as it inhibits the balanced nature of the car at speed. All cars will receive a new instrument panel that is in reverse colors of the original — it's now white on black. The panel is better integrated with improved visibility, red coloring for the multi-function display and three-tier shift lights that are intelligent enough to vary their timing with rate of engine speed. The new lights result in a consistent shift indicator when nearing the 8500-rpm limiter. The shift lights are a little difficult to see in bright daylight, but the engine and intake noise are more than enough to gauge rpm. Unlike the base Elise's non-supercharged Toyota-sourced 2ZZ 1.8-liter that must be constantly flogged to keep up momentum, the SC car lunges forward with nil resistance — the engine's torque making for instant response. Finally Lotus has fitted an engine that has the same telepathic response as its revered steering. A new twist to the car is that the ECU varies the cam-switch of the Toyota engine depending on throttle usage: Heavy on the pedal and the cams switch at 4000 rpm; gradual progression and it switches at 6200 rpm. This keeps the engine from falling off the cam between shifts like the NA version. Likely another reason the SC imparts the feeling of constant thrust, rather than the somewhat impotent NA car. Fuel economy is 20/26 mpg making the required premium fill-ups "not so bad." My opinion is that every Lotus Elise should use the supercharger. It's such a vast improvement to the car for a measly 26 lb. weight gain. The benefits are far reaching. The car's engine noise is quieter, emitting a smooth belt whine that increases in pitch perfectly with the engine's speed. At low speed when dealing with traffic, the added torque makes 2nd gear wonderful to creep in. Uphill right-hand turns at a stop sign can easily be taken from a standstill with a slight dip in the throttle. The NA car will lug a bit and fidget off the line, while the supercharged car just simply goes as if it were simply rolling down a hill. No need for high rpm and clutch slipping. The car has a docile behavior on the street but put the hammer down, and there is a much appreciated frenetic quickening that matches the car's character. Light and nimble = good, but light, nimble and powerful = superb. May every reader be so lucky as to experience the perfection of an Elise on a sunny Sunday morning, chasing down lesser cars or motorbikes on their favorite back road. The amount of luck necessary for a base SC is $54,000. Add the leather, i-Pod adapter, cupholder and refinement of the Touring pack for $1600, or the Performance Package with a stiffer ride, forged wheels, lighter ProBax seats and traction control for $2600. If you must have the torque-sensing LSD, it's $1790 and requires traction control. I'll take the base SC car in British Racing Green, thank you.